Randwick Electrical Services is proud to work in the vibrant suburb of Kingsford. If you’re looking for reliable electricians in Kingsford, the Randwick Team is on-call. In a high-density suburb like Kingsford, homeowners and renters can feel a little more secure with sophisticated outdoor lighting choices. 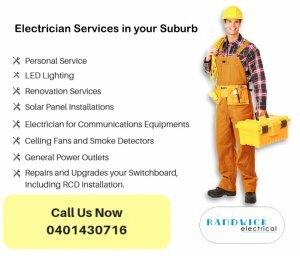 Experienced advice from the professionals at Randwick Electrical can go a long way before you install or renovate lighting on your patio and garden. We can bring you up-to-date services, including energy saving options. Renting to Students? We Can Help. University students aren’t always the most energy conscious people. By making your rental outfitted to be as energy-efficient as possible, you’ll save money in the long-run (especially if utilities are included!) And for the students who do value energy efficiency, they’ll be proud to rent from a landlord who shares those values. Other updates that prepare your building for student occupancy include upgrading your switchboards and data cabling. Luckily, we’re your one-stop electrician in Kingsford for all your rental upgrades.